GVK Group chalks out an ambitious plan to retire debt in the holding companies of its core infrastructure business. About a fortnight after GVK Power and Infrastructure Limited (GVKPIL), the listed infrastructure arm of the Rs 4,000 crore GVK Group , informed the Bombay Stock Exchange that it had got the approval of its board to raise fresh capital, including an option to issue a qualified institutional placement (QIP), an important meeting was summoned by the company in Mumbai. Sometime in mid-June this year, a group of company executives went into a huddle. Business Today learns that this was not just another meeting but one that discussed plans to pare the substantial debt of GVKPIL. Indeed, like most infrastructure companies in India, GVKPIL-GVK's holding company for its infrastructure business - is facing huge financial challenges. The company had a turnover of over Rs 2,800 crore in 2013/14 but it also had a total consolidated debt (including all its 18 subsidiaries) of Rs 22,000 crore. We are in execution mode. For the first time in our history, we have projects going on-stream in the same year and will start generating revenues. Its net debt (debt minus cash balances) to equity ratio of 3.4:1 in 2013/14 is way above the comfort zone of 2:1 that it wants to reach. Worse, some Rs 3,000 crore of this is on the books of GVKPIL and its subsidiary holding company for the airports business, GVK Airport Developers. These two companies do not have any operating assets to service the debt from earnings. It is this debt that the GVK Group plans to pare substantially. Indeed, unattended, loans at the holding company level will lead to a debt trap - without income generating assets the company would have to constantly keep borrowing to pay back previous debt. "We are exploring all options to reduce the debt at the holding company level," says A. Issac George, Director, Finance, GVK Group and CFO, GVKPIL, These options, industry insiders say, include a mix of a QIP, a route that the listed entity (GVKPIL) can take, and an initial public offering (IPO) that the unlisted airport entity can opt for. A QIP is a capital-raising tool and refers to the issuance of equity shares, fully and partly convertible debentures, or any securities other than warrants which are convertible to equity shares, to institutional buyers. GVKPIL also plans to get a private equity investor or a sovereign debt fund or a strategic investor on board. The group is exploring all these options. The GVK Group took almost 18 months to firm up plans to prune debt. It is now focusing on the execution of its strategy. "Enough is enough. We cannot have debt and we do not want to take on more debt. We are just focused on stabilising things, clearing the debt," says G.V. 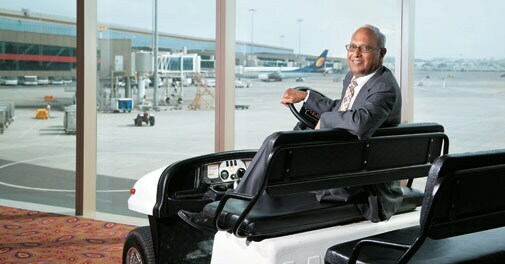 Krishna Reddy, Founder and Chairman, GVK Group. "Until we clear our debt, we are not going to bid for any new project, except for the Navi Mumbai airport, because there we have the first right of refusal." The QIP planned for GVKPIL can be completed in about eight weeks. GVKPIL informed the BSE on May 29 that it has received board approval to the issue and allotment of equity shares of the company, not exceeding Rs 1,000 crore, with a greenshoe option to retain up to Rs 500 crore from any excess subscription it receives, including after any offer to qualified institutional buyers. But the promoters, the GVK Reddy family, have a 54.6 per cent stake in the company. Any move to raise a big amount is likely to reduce the promoter stake well below 50 per cent. It would therefore be reasonable to expect a QIP in the range of Rs 500 crore to Rs 700 crore, diluting the promoter holding between four and 10 per cent depending upon the share price. Then, GVK plans an IPO for GVK Airport Developers Pvt Ltd. 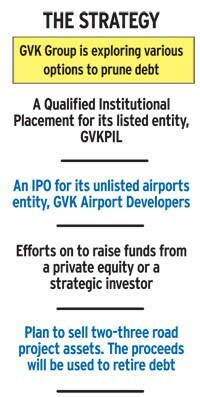 The promoter company, GVKPIL, holds almost 100 per cent stake in the airport arm. 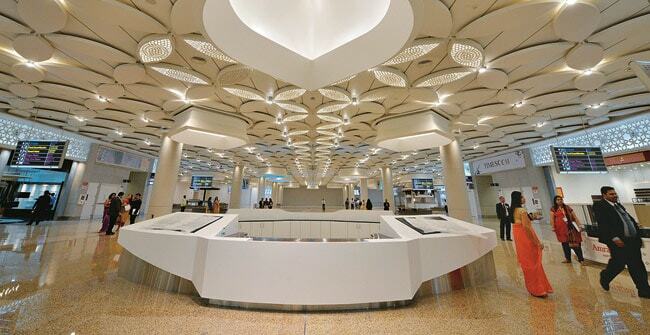 The stake dilution in GVK Airport Developers will be based on the valuation of its holding in Mumbai International Airport Ltd (50.5 per cent) and Bangalore International Airport Ltd (43 per cent). This company accounts for a bulk of the debt - Rs 2,500 crore - at the holding company level. Business Today gathers that it is reasonable to expect that the promoter holding could reduce by around 25 per cent, which could mean an IPO between Rs 1,200 crore to Rs 1,500 crore. However, GVKPIL will need its shareholders' approval for the QIP and the IPO. Its Annual General Meeting is on August 13 and so any progress on these fronts can only be expected towards August end. Meanwhile, GVKPIL executives are negotiating with private equity and strategic investors. The company already has three term sheets in hand, one each from a marquee private equity investor, sovereign fund and a strategic investor, and is evaluating the best option among them. Simultaneously, the group is actively exploring all options to sell assets that can help raise funds. For one of the assets the buyer has already started the due diligence process and a term sheet has been signed. The money from this will be used to repay part of the debt. GVK is also looking to sell another two or three assets in the roads sector. In all, GVK hopes to raise around Rs 3,000 crore allowing it to retire the debt of its holding companies. The company is also gearing up to launch several projects over the next few months. This would further boost its revenue and help trim debt. G.V. 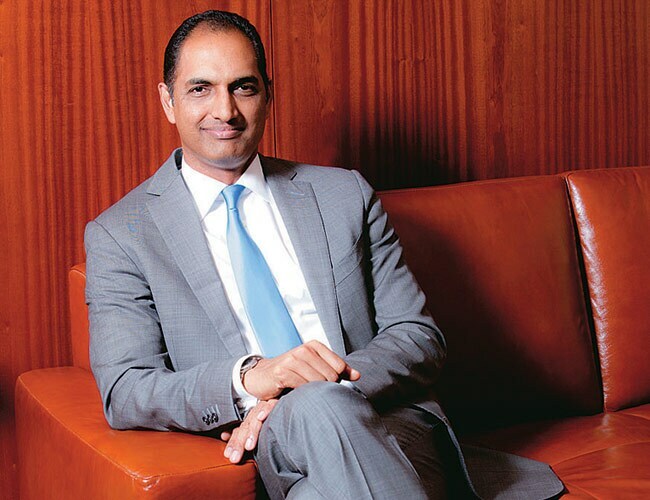 Sanjay Reddy, Vice Chairman of the group and son of Krishna Reddy, who has been leading GVK's foray in sectors like power, biosciences and airports, told Business Today that the focus over the next few months for the group would be on execution. "Unlike other businesses, infrastructure strategies cannot be shifted overnight. Projects once started need to be completed. We are today purely in an execution mode and, for the first time in our history, we have several projects that are going on-stream in the same year and will start generating revenue," he says. Four projects that are under construction will start earning revenue in 2014/15 and they are expected to generate around Rs 2,000 crore in the fiscal year, according to George. These projects include the 363 MW hydroelectric project on the Alaknanda river in Uttarakhand, 540 MW coal-fired Goindwal Sahib power project in Punjab, Tokisud coal mines in Jharkhand and the National Highway 12 Deoli-Kota road project in Rajasthan. The GVK Group though does not have a problem of debt with its non-infrastructure businesses, biosciences and hospitality, says Sanjay Reddy. There are ambitious plans for the biosciences business which had a turnover of Rs 650 crore in 2013/14. "Until we clear our debt, we are not going to bid for any new project, except for the Navi Mumbai airport"
Krishna Reddy says his group eschews taking debt and so its experience of the past four years has ensured that many lessons have been learnt. This will now be reflected in the nature of projects that the group will pursue in the future, he stresses. "We will look to expand into areas where government intervention is minimum, where investments are low and where people are the capital," he says. The group will not be restricted by the infrastructure sector and can move into other sectors, he asserts. So, how did the GVK Group end up with this debt when it had been conservative earlier too? GVK raised a large amount of debt - around Rs 1,800 crore - for the two airports in Mumbai and Bangalore in 2011 after it was unable to get an investor, says Reddy. This debt was largely on the books of GVKPIL and GVK Airport Developers. "The going was good and all of a sudden because of some government regulations, investors from other countries lost confidence in India and did not want to invest in the country," says Reddy, indirectly referring to the controversy involving the government's retrospective amendment to tax laws to recover tax from Vodafone on its acquisition of Hutchison Essar. However, GVKPIL is still better placed than most other infrastructure companies. For instance, it has lower debt on its books than Lanco Infratech or GMR Infrastructure. "They do have a lesser problem on hand but they also have the Australian coal mine and they need to figure out what they intend to do with it because that requires a big investment," says Shirish Rane, analyst at IDFC. The Australian government has already given some of the approvals required for GVK's gigantic coal mining project in Queensland. "What they do in Australia will define this company in the next five years, simply because of the quantum of funds involved," says Rane. "... investors are asking why they should bring huge capital into India at this stage without existing problems getting sorted out"
The Australian project will need a whopping $2 billion plus equity. But then, the Australian project today has limited bearing on the group. The investment into Australia is mainly through the GVK promoter family, which holds 90 per cent in GVK Coal Developers (Singapore) Pte Ltd, the company that has invested in the coal mine. "GVKPIL has only committed 10 per cent of the company's share capital," says George. L. Madhusudhan Rao, Lanco's Chairman, says infrastructure companies have problems in getting investors on board because of the macro-level issues confronting the sector. "Investors are asking why they should bring in huge capital into India at this stage without the problems getting addressed." The outstanding issues include fuel linkages in the power sector and power transmission woes, according to Rao. There is hope that the new government will sort out the issues, he adds. For the moment, all eyes will be on GVK over the next few months as it seeks to do a course correction and de-leverage itself.